Was McDonald’s ‘Signs’ Ad on the Golden Globes Inspiring or Abominable? The centerpiece spot, part of a broader brand refresh that began with the quite well-liked "Archenemies" ad, got a less-than-enthusiastic response on Twitter during NBC's Globes telecast. "McDonald's is presenting itself as the face of corporate kindness? PAY YOUR EMPLOYEES A LIVING WAGE," said one detractor, in a post retweeted more than 80 times. Said another, "@McDonalds I just threw up in my mouth watching your commercial… Desperate attempt to rescue your image." To be fair, some viewers enjoyed the spot. "This McDonald's marquee sign is fantastic!" tweeted the handle of Des Moines radio station Star 102.5. But the backlash around the fair pay debate is predictable, given the high profile of the recent Fight for 15 protests. And that makes a sign like "Keep Jobs in Toledo" seem kind of tone deaf, even if it technically refers to a nearby factory at risk of closure. Plus, the soundtrack—a children's choir covering indie pop band Fun's "Carry On"—makes such a clumsy grab for the audience's heartstrings that it's hard not to think of crocodile tears. In the words of another viewer, "I'm not lovin' it." See more of the Twitter reaction below. What do you think of the ad? Can't stop thinking about how weird and gross that McDonald's ad is. This McDonald's ad is like everything I've ever had to tell my clients "NO YOU HAVE NO STAKE IN THIS CONVERSATION, BIG BRAND!" Barf. 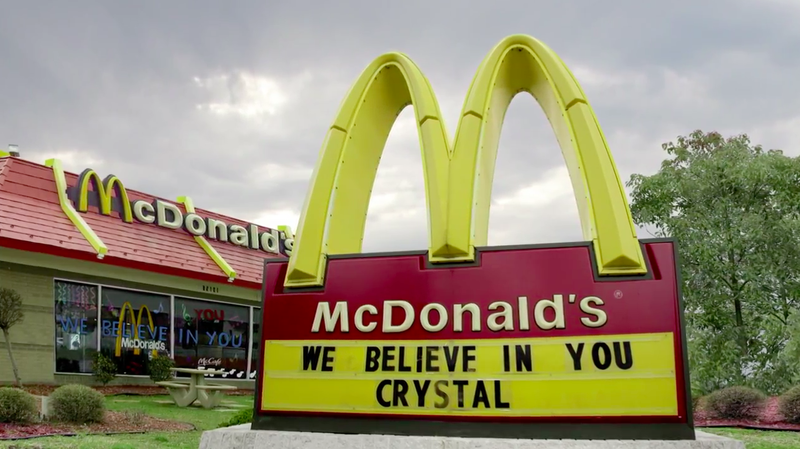 McDonald's has reached a new, delusional level of grandeur with their "marquee" commercial.